A town born with the Camino, on the Camino, and for the Camino and that still practically lives for it. The centre, founded in the XI century by the saint whose name has been maintained, has strengthened over the centuries in its function as a historical end stage. Famed for its hospitable vocation, the architectural richness of its monumental centre, and for being the site of the famous miracle of the cockerel and the hen, and of the hung Pilgrim, one of the most widespread Jacobean legends. Its cathedral is the only temple with permission to have animals living inside in a chicken coop. Its various monuments allow the walkers to recall the history of Santo Domingo, a hermit who wanted to be a monk but was not permitted. After retiring to live in a forest that occupied the enclave he noticed the difficulties pilgrims faced to continue their journey to Compostela, as such he decided to work to facilitate their transit by building a bridge to cross the mighty Oja river, a hospital for refuge, and a road to link Nájera with Redecilla del Camino-for which he felled a number of oaks that hindered their path-and built a small church which no longer exists. Upon his death (1109), and after being buried close to the very path founded by him, the construction of buildings began around his tomb, marking the beginning of a small hamlet, which continued to grow under royal protection. Curiously Santo Domingo is the patron Saint of public building works, engineers and Spanish Caminos. Today, the Town maintains its ties to the Camino through its accommodation and services tailored to the pilgrims needs. All those pilgrims arriving in the town between the 10th and 15th of May can join the Fiestas of the Saint which, include a multitude of traditions and rituals that commemorate the memory and work of this Saint. The main day takes place on the 12th, when they commemorate the saint's death. At dawn they celebrate a traditional brunch for the Saint, distributed to the residents by the brotherhood of the procession. This meal, which includes chickpeas with meat and vegetables, is served to remember the solidarity of the patron Saint. In terms of gastronomy there are various bakeries, which Culinary recreate the famous miracle of the hanged pilgrim, in the form of a typical sweet, known as ahorcaditos. Visitors can purchase the sweet, among others, in the bakery Isidro (Calle Pinar, 52). 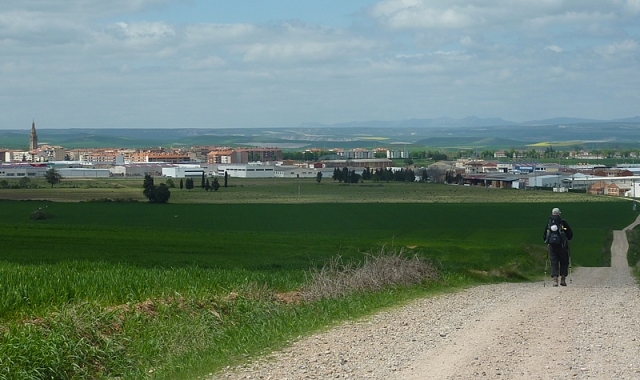 If you are traveling on the Camino de Santiago or are planning to do so soon, you should know that the distance separating Santo Domingo de la Calzada from Santiago de Compostela is 566 kilometers.